Rare, unique and simply beautiful, this pointed briolette emerald pendant offers a myriad of green hues and wonderful flashes of light. This pendant also features four sparkling round cut diamonds and is suspended by a sturdy double link rope chain. 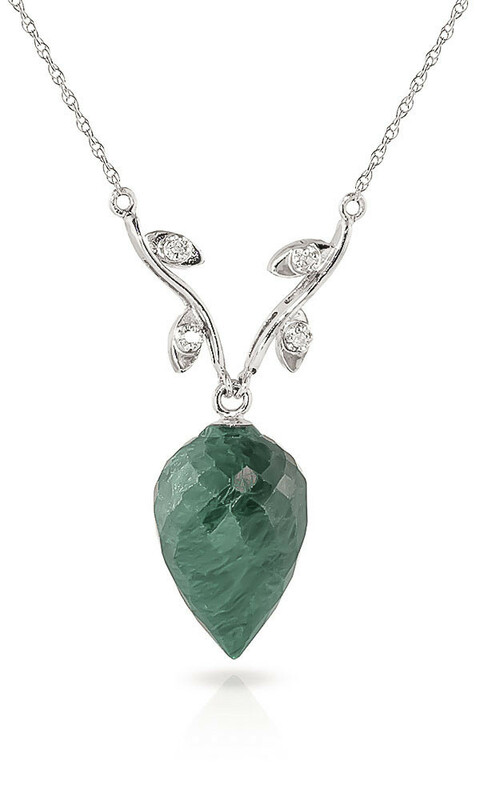 An impressive 12.9 carats of emerald make this necklace something to envy. Single 12.9 ct natural emerald, four diamonds, I-3/K, total 0.02 ct. Pointed Briolette cut. Pendant suspended from white gold double link rope chain with spring clasp, length options from 14" to 24". Available chain thickness 0.68 mm (pictured) and 1.15 mm. Very happy with the quality of the jewellery.